The British statesman and versatile scientist Charles Stanhope, Viscount Mahon (see biography of Charles Stanhope) devoted considerable part of his time and money to the developing of three calculating devices of an original design, and a logic machine (see The Demonstrator of Charles Stanhope). 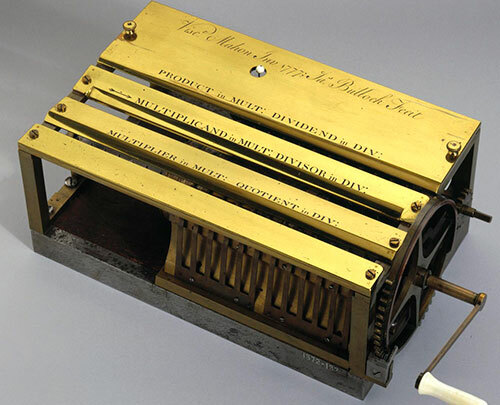 The calculating machines of Stanhope were manufactured by the skilful mechanic James Bullock, the first machine—in 1775, second—in 1777, and the last—in 1780. The last machine (from 1780) is the simplest of the three devices (see the photo below), and it is inscribed on the cover: ”Visc(oun)t Mahon Inv(enit) 1780 Ja(me)s Bullock Fecit“. The machine was a small and simple adding device with dimensions: 2.2 x 23.2 x 7.5 cm, weight is 0.9 kg. Stanhope's adding device has 12 digital positions (dials). 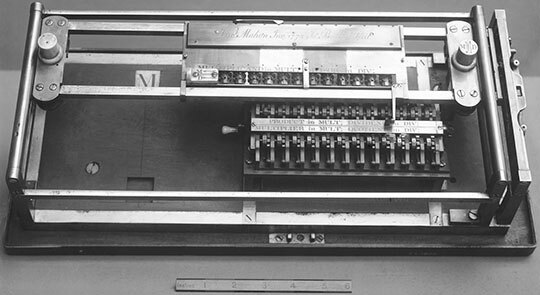 The first eight (leftmost) dials are decimal and are labelled HM for hundred millions, XM for ten millions, M for millions, HT for hundred thousands, XT for ten thousands, T for thousands, H for hundreds, and X for tens. The next four dials are labelled L for pounds, S for shillings, D for pence and F for farthings. This is the old English system of money, used until 1971 (4 farthings = 1 penny, 12 pennies = 1 shilling, 20 shillings = 1 pound sterling). The rotating of the dials and entering of the numbers is done by means of a stylus, which can be put in the openings in the periphery of dials. The dials are successively connected within the mechanism by means of wheels with just one cog, thus the tens carry mechanism was difficult to use, having a problem with the transfer of forces. The other two calculating machines of Stanhope are more complex devices and can be used for the four arithmetical operations. In the machine from 1775 (see the photo below) was used the well-known stepped drum of Leibniz, which teeth however are not smooth, but actually are teeth-strips (strips with 1 to 9 teeth). This type of mechanism is also called adapted stepped drum or adapting segment. The dimensions of the machine (with the mahogany case) are: 9 x 45 x 17.5 cm, weight is 9 kg. The calculating mechanism contains 12 adapted stepped drums (see the photo below), mounted on axes in a special movable carriage. To the axes are attached digital wheels (dials), and to the each digit of the dial corresponds a strip of the drum with the appropriate number of teeth (i.e. to digit 0 corresponds the smooth surface of the drum, to 1—a strip with 1 tooth, etc.). During the calculations the carriage is moved, and during this movement teeth-strips will be engaged with the gear-wheels of the main counter and will rotate them according to the teeth of the strip. This first transfers the entered number into the result mechanism and then does the tens-carry steps, if needed. There is also a secondary counter, which counters the number of the moving of the carry and is used during multiplication/division. 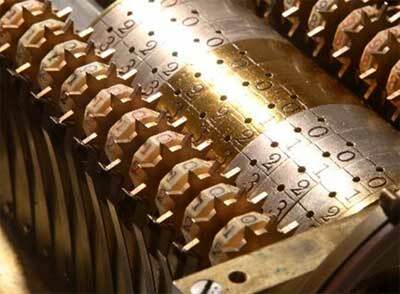 The machine also features a place-shift mechanism to allow multi-digit multipliers and to facilitate division. During multiplication the multiplier is set at the beginning and when zero is reached, the multiplication is complete. This also facilitates subtraction and division, as the counter rises from zero to the answer. To prepare the machine for this, a toggle lever at the side is moved until a D appears in the window to right instead of an M. This reverses the process during the push-and-pull of the carriage: the transfer to the result mechanism now takes place in the second step, with all rotations reversed, and the tens-carry steps are performed in the first step. However, this has the disadvantage that the tens-carry steps arising in the second step are not carried out. Stanhope solved this by incorporating an additional small white-handled crank at the left side with which any outstanding tens-carry steps can be done. The tens carry mechanism is rather complex and innovative. Actually Stanhope is the first inventor (although in the sautoir of Pascaline there is something similar), who separated the tens carry operation to two phases: a preparation phase, which is done when the digital wheel rotates from 9 to 0, and the execution phase, which is done during the movement of carriage. Some 100 years later on this 2-phase operation of tens carry will be widely accepted by the mechanics, because this mode of operation removes the very nasty effect of accumulation of strength in the mechanism. 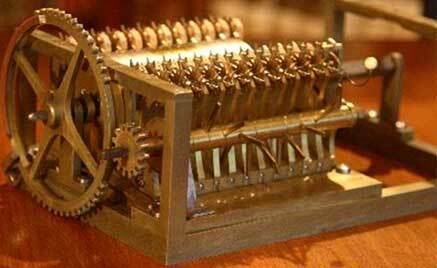 The machine from 1777 (see the photo below) is somewhat similar to this from 1775, using again Stanhope's adapted stepped drum mechanism, but in it the linear movement, used in the first machine, is replaced by the more convenient and fast rotating movement. The tens-carry mechanism was also improved. 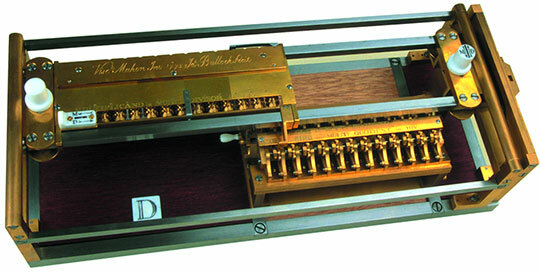 The machine was made by brass, iron, ivory, and wood (mahogany case). It's dimensions are: 36 x 22 x 21 cm, the weight was: 9 kg. Multiplication and division are performed by repeated addition and subtraction with intermediate carriage movements, using a 12-place revolution counter operated by a lever connected to the setting mechanism. Stanhope's first calculating machine (from 1775) has several flaws, but creating his thorough second machine in 1777, he demonstrated that he was able to build an elaborate and fully functional 4-species device. 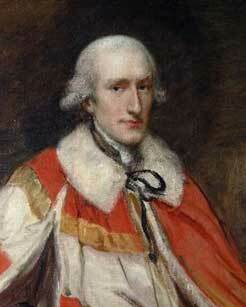 Thus he counts as one of the most innovative inventors of mechanical calculators of the 18th century. The prototypes of first two calculating machines of Stanhope were eventually acquired by Charles Babbage, passed down to his son Henry P. Babbage, and given by him to the Victoria and Albert Museum in London in 1905.